As I sit on a petrified log that's more than 200 million years old, I watch a northern harrier cruise like a miniature jet just above the grasslands of Petrified Forest National Park. 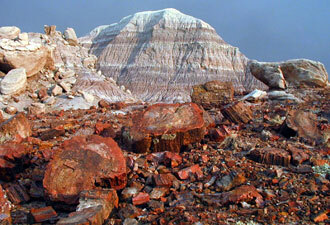 Known to many as a “science park,” Petrified Forest is also a place to discover quiet, clear air, and solitude. There is something here for almost anyone, whether your preference is looking at an amazing view from the car or spending a star-filled night in the wilderness. Watching that agile raptor soar, I imagine the ancient ecosystems represented by my fossil perch. More than 200 million years ago, during the Late Triassic, this region was part of the supercontinent Pangaea and was located just above the equator. In a climate that was more tropical, rivers meandered across a floodplain. More than two hundred types of plants, including cycads, ferns, and giant horsetails, grew in the humid atmosphere. Great, towering conifers formed galleries along the waterways. Crocodile-like phytosaurs hunted in the water while stocky placerias browsed vegetation to eat. Horseshoe crabs, crayfish, clams, and insects were some of the smaller creatures once abundant in this vital ecosystem. Today all those animals and plants are represented by the amazingly diverse deposits of fossils that include the many-hued petrified wood. 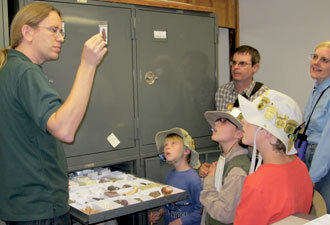 Scientists from around the world come here to research the many clues to this intriguing past. You too can explore the Late Triassic by visiting the exhibits at Rainbow Forest Museum or walking the trails at Giant Logs, Crystal Forest, and Long Logs. Touch a fossil tree still laying where it eroded out of surrounding rock, and you are connecting with the deep past. From my fossil perch, I can see a small pueblo built as a seasonal home more than 900 years ago by the ancestral Puebloan people. These farmers used the area's most common rock for their masonry walls: chunks of petrified wood. The Agate House is aptly named for the petrified pieces used to build it. Artifacts and archeological sites in the park indicate human use of the region for more than 13,000 years continuously, from hunter-gatherers to the heyday of Route 66. Walking the trail back to the Rainbow Forest Museum, I think about all the things that people can do while visiting Petrified Forest. Wander along one of the park's many trails, like the Rim Trail overlooking the colorful badlands of the Painted Desert. 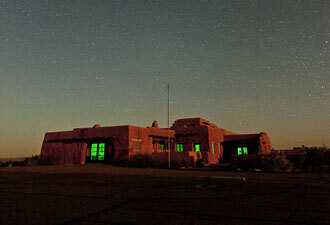 Hike into the designated wilderness, birdwatch near the ephemeral Puerco River, and view the Hopi murals at the Painted Desert Inn National Historic Landmark. You can photograph the surreal landscape of Blue Mesa, wonder at the evocative petroglyphs, or maybe catch sight of a pronghorn sprinting across the prairie! This is all here, just waiting for you! Stop in at the visitor center for a warm welcome and some great ideas for a wonderful experience at Petrified Forest National Park.